After being obsessed with WPF for so many years, I can’t just forget about it. 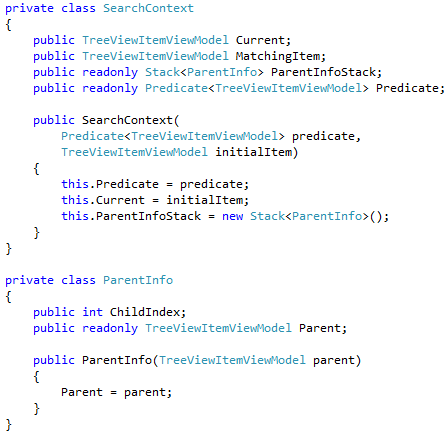 Even though my focus is now on iOS development, I still think that WPF is an awesome platform. That’s why I wrote an iPhone app named Master WPF. It contains 500 questions, spread across 28 topics, that I painstakingly wrote, organized, and proofread until my eyes bled. The questions will help any WPF developer sharpen their skills. 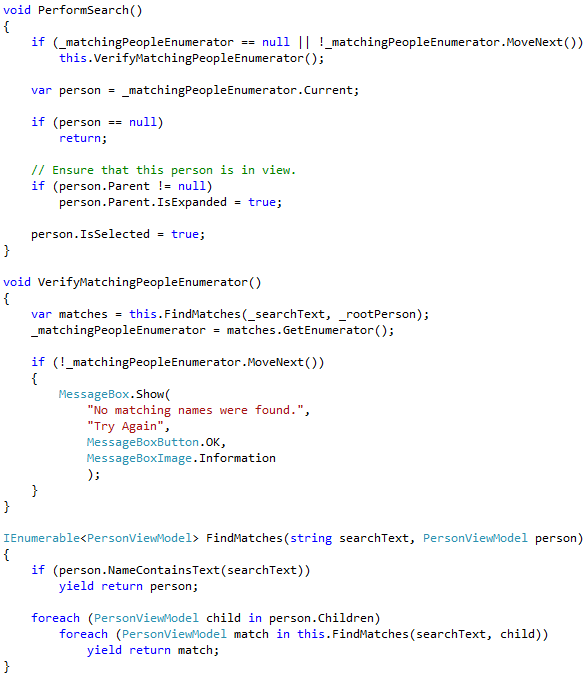 It’s for WPF noobs, gurus, and everyone in between. You can download Master WPF for free on your iPhone or iPod Touch, running iOS 5 or greater. The app comes with 15 free questions so that you can try it out. If you decide that you want to master WPF with my app, you can make a small in-app purchase to unlock all 500 questions. Think of it as a donation to a recovering WPF addict. I just got back to NYC after spending six days in Los Angeles, attending the PDC. It was my first time attending a conference of such massive proportions. If you have never attended one, I suggest you do. Aside from the exciting material covered by some (certainly not all) of the sessions, it also provides you with a great way to meet people and make professional contacts. Also, you end up leaving with a veritable mountain of crap…err “swag”…that you can eventually throw away after you lug it all home. I was blown away by how much interest and enthusiasm I saw for WPF. Most of the WPF sessions (i.e. presentations about WPF) were packed, and even had overflow rooms that were packed. I think a lot of people are starting to see WPF as the future of desktop Windows programming, not as just some interesting “thing” that Microsoft is promoting. The session about the new WPF DataGrid and Ribbon controls had two overflow rooms! I’d like to thank Infragistics, my employer, for sending me out there. I’d also like to thank the great people I met out there, who made the experience so enjoyable and interesting. It was great to finally meet many of the WPF Disciples, and other folks, with whom I had only ever communicated via e-mail in the past. I must admit, I had never really become too comfortable with the C# ‘yield’ keyword until recently. I knew that it was introduced in C# 2.0 as a means of simplifying the creation of an enumerator. I also knew that the C# compiler interprets the code in a method that uses the yield keyword. A compiler-generated implementation of IEnumerator exists behind the scenes, which implements the logic to produce the enumerator you declared in C#. Beyond that vague understanding, I was not too familiar with it. It felt “odd” so I rarely used it. The article also has a demo program that lazy-loads each item’s children. That demo does not provide the ability to search. Shortly after publishing the article, two people asked how to have a lazy-loaded tree with search capabilities. Aside from the fact that performing a search that produces no matching items will force all of the items to be loaded; it is a reasonable question. I decided to implement a solution. I have plenty of experience building recursive algorithms that walk over trees, but I had never built one like this. Most recursive algorithms store their state on the callstack. Each time the recursive method is called, a new frame is pushed onto the callstack, and it keeps track of the local variable values for you. By ‘local variables’ I mean things like, the current item, the index of a for loop, the parent item to which we return after processing a sub-tree, etc. That’s all well and good, until you need to create a recursive method that returns a value and, later on, needs to resume processing from where it left off last time it was invoked. This is exactly what I needed to build. I needed to create a recursive algorithm that stores its state in an external data structure, so that I can effectively save and load that state between executions. It was an exciting Sunday morning programming exercise, for sure! 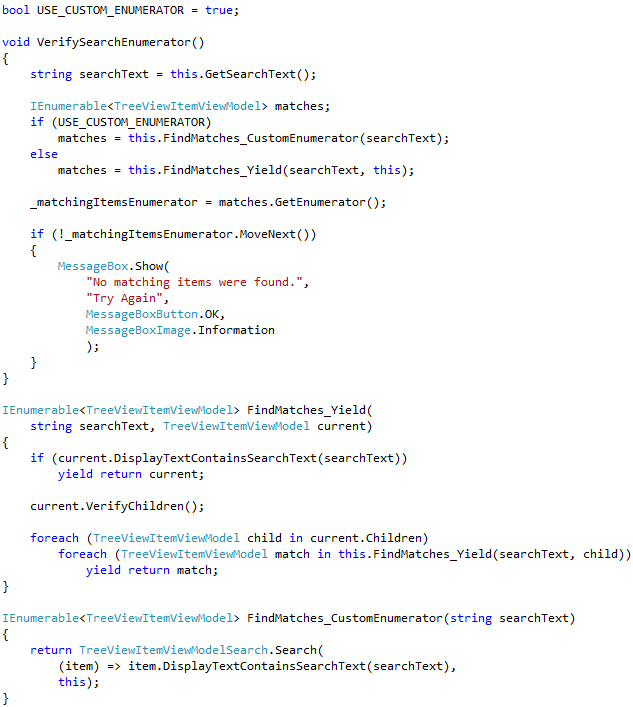 As seen in the FindMatches_Yield method, all that I had to do was add in code that lazy-loads the child items before it searches them! The compiler-generated implementation of my search logic will be invoked every time the enumerator’s MoveNext is called, and it only searches for one item at a time. This is perfect for a load-on-demand scenario. If I had known about this earlier, I never would have bothered to write that custom search enumerator. But then again, it was a lot of fun and quite interesting to implement, so it’s all good! Download the source code here: treeview_with_viewmodel_lazyload_and_search_demo Be sure to change the file extension from .DOC to .ZIP and then decompress the file. A few months ago I flew out to Redmond so that I could speak at Microsoft’s WPF Bootcamp. I gave a presentation about implementing the Model-View-Whatever pattern in WPF, which was received very well by the attendees. After giving that presentation I solidified the material into my ‘Using MVC to Unit Test WPF Applications‘ article on CodeProject. This seminal work is the foundation of the structural skinning architecture seen in Podder. The entire WPF Bootcamp 2008 was videotaped and recently published online. Karsten announced it a few days ago in this post. All of the videos and associated downloads are hosted in a Silverlight application (of course), which you can view here. NOTE: That page comes up empty for me in FireFox, so be sure to open in it Internet Explorer. You can find my presentation under Day 3. It is called “Hello, Real World!” and runs for about one hour. I highly suggest you check out some of the other presentations, too. There were many interesting things discussed during the bootcamp. Ever since I rejoined Infragistics, I have been in almost daily contact with Craig Shoemaker. We do not work in the same group, or even work on the same projects, but I just really enjoy chatting with him since he’s an all-around great guy. In case you are not already familiar with Polymorphic Podcast, Craig’s popular .NET podcast, I recommend you check it out sometime. The Web is full of comments where people generally voice the same issue with WPF. It seems that everyone and their grandmother thinks WPF is only useful for companies building apps with “differentiated user interfaces.” Ya know, Times Reader, Yahoo Messenger for Vista, etc. 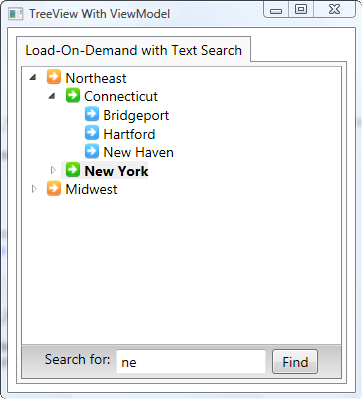 A common thread is that if you are building line-of-business (LOB) applications, WPF is not going to give you much over WinForms. While understandable, this opinion is simply wrong. Need proof? Check out the Lawson Smart Client app. What I expect to see, in abundance, is third-party and open-source visual themes that can simply be plugged into any application. Development teams will use pre-canned visual designs. There’s gold in them hills. Once a development team can purchase/download a set of styles/templates/resources to turn their drab LOB apps into something like Lawson Smart Client, WPF will be the de facto choice for LOB projects. Of course, I assume by that time design-time support for WPF will be much better and supportive of RAD. Without that, all bets are off. These types of pre-canned themes are already available to a certain extent. The Reuxables product seems interesting. I have not used it yet, but it seems on the right track and worth trying out. Infragistics offers Theme Packs, which you can use to restyle Infragistics controls. Products like these are the future of WPF and Silverlight development, considering that most dev teams neither have access to or can find Visual Designers. You are currently browsing the archives for the General Info category.